Use your imagination with THE BOXTROLLS! A family event movie from the creators of “Coraline” and “ParaNorman” that introduces audiences to a new breed of family – The Boxtrolls, a community of quirky, mischievous creatures who have lovingly raised an orphaned human boy named Eggs in the amazing cavernous home they’ve built beneath the streets of Cheesebridge. On Sunday, September 14 from 1-3PM, head over to Heroes Aren’t Hard to Find for THE BOXTROLLS Cardboard Challenge! THE BOXTROLLS are teaming up with the Imagination Foundation to invite kids of all ages to build anything they can dream up using cardboard, recycled materials and imagination. 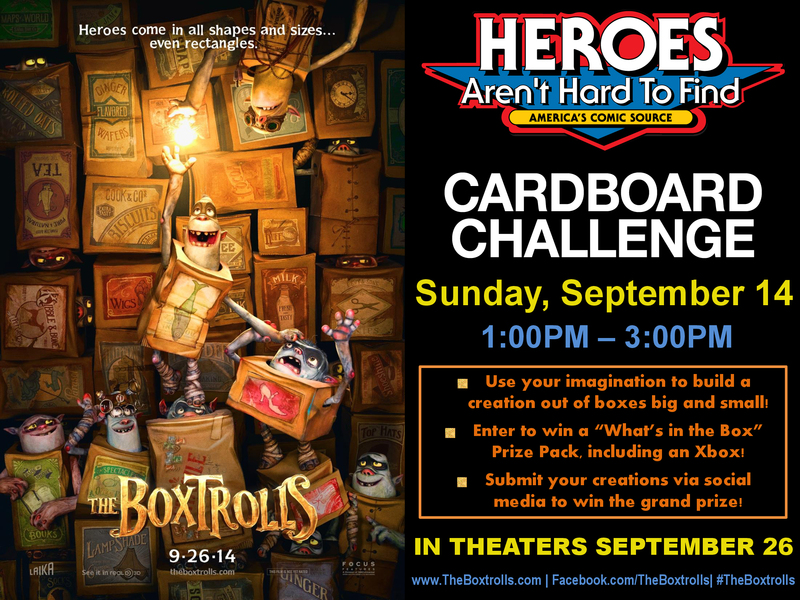 Participants will receive fun prizes from THE BOXTROLLS, and can enter-to-win a “What’s in the Box” Prize Pack, including an Xbox One. Post your creation on Twitter or Instagram with #TheBoxtrollsCC for a chance to win the national overall prize, the “Imagination Box,” including an Apple iMac, an iPad Air, and more! THE BOXTROLLS, in theaters September 26!